Gary Thornton. Picture: Andrew Roe. 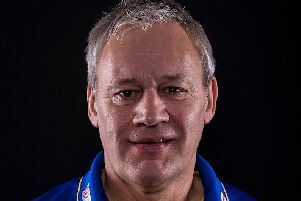 HUNSLET BOSS Gary Thornton has described tomorrow’s visit of Newcastle Thunder (3pm) as the “biggest game of the season for us”. The Parksiders slipped to seventh in Betfred League One after last week’s 46-10 defeat at Whitehaven. With two rounds remaining in the regular season, they trail fifth-placed Oldham and Whitehaven – who are sixth – on points difference, but Oldham face second-placed Bradford Bulls tomorrow and Whitehaven complete their campaign at leaders York City Knights next weekend. If Hunslet, who visit Coventry Bears in their final game, win their last two matches and Oldham and Whitehaven slip up at least once the south Leeds side will sneak into the play-offs. “We are have got a bit of pressure on us, but we have got the advantage of being at home,” Thornton said of tomorrow. “Newcastle are a good team, we can’t take them lightly. “They had a terrific win last week against Workington, they played really well. “They are difficult to play against, they’ve got plenty of speed and experience, but we have got to keep positive. Thornton is demanding a “massive” improvement from last week’s performance. He said: “We were poor away to York a few weeks ago and got a response in the next game at home to London. “We are in exactly the same position. “We have to be better across the board, we have to be smarter in attack with our decision-making and defensively we’ve got to work a lot harder for each other and not give up easy metres.